So Chilean President Sebastián Piñera, in Rio de Janeiro for the summit on sustainable development, is giving an interview to the BBC’s Spanish-language service when correspondent Gerardo Lissardy tries to ask him a final question about the Pinochet film screening/tribute held in Santiago earlier this month. At that point Piñera’s press secretary Constanza Cea places herself in front of the camera and declares the interview to be over, saying they were out of time. Not only that, but she places her hand over the camera lens and the audio plug is pulled, and Piñera ends up looking like an apologist for the dictatorship. And the incident hits the headlines in Chile and elsewhere. “If I was her boss, I’d fire her,” a furious Chilean colleague e-mailed me. Chilean novelist Roberto Ampuero’s thirteen books have been translated into German, French, Italian, Chinese, Swedish, Portuguese, Greek and Croatian and the Spanish-speaking world has awarded him several literary prizes. But only now are English-speaking readers getting a chance to read his work. 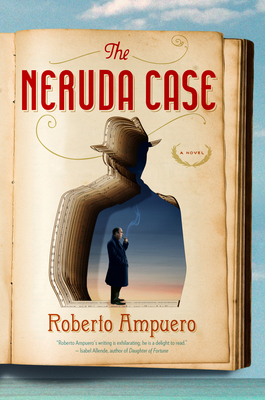 This month Riverhead Books, a division of the Penguin group, has published The Neruda Case, one of Ampuero’s six detective novels featuring Chilean sleuth Cayetano Brulé. The Neruda Case opens in present day Valparaiso, with vivid descriptions of the port city’s “fifty teeming, anarchic hills” and its inhabitants who “risked their lives on shabby postwar trolleys and a handful of whining cable cars each time they rode to work or to homes with crumbling balconies and gardens that settled gracefully on peaks or clung precariously to hillsides.” Cayetano Brulé watches the city, remembering his work as a much younger man, and a photograph of Nobel laureate Pablo Neruda sends his mind back to 1973, before the military coup that ousted Socialist president Salvador Allende. The poet, gravely ill with cancer, summons Brulé and asks him to track down an old acquaintance last seen in Mexico. Some good news from the academic world: four Chilean institutions are among Latin America’s top ten universities, according to the QS World University Rankings 2011/12, with the Pontificia Universidad Catolica in second place, followed by the Universidad de Chile (fourth), the Universidad de Concepcion (ninth) and the Universidad de Santiago de Chile USACH in tenth place. 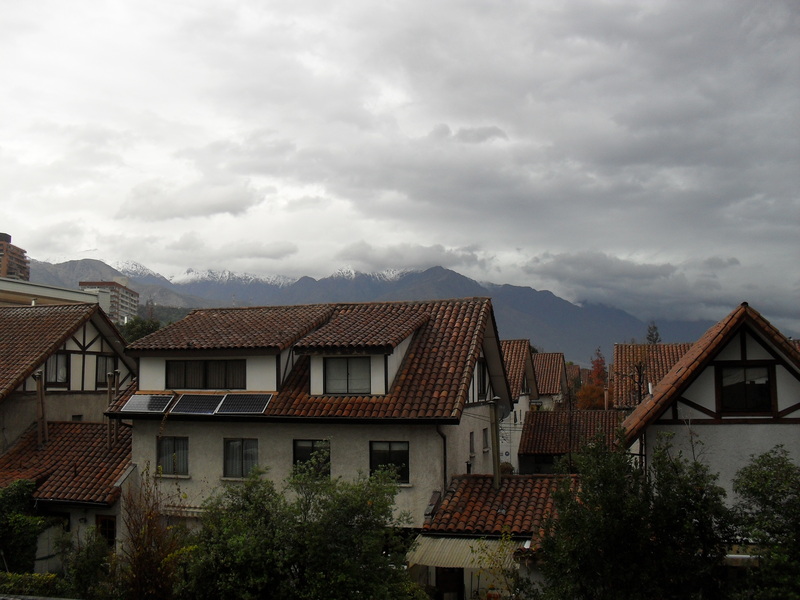 The view from an apartment building in eastern Santiago. Photo by Odette Magnet. The smog is awful in Santiago this time of year, but when you can see the snow-capped Andes in the distance the Chilean capital is a delight. CNN International has just given it third place, behind Shanghai and Tokyo, in its list of the world’s ten most loved cities. Number of people attending the screening: about 1,200, according to carabinero police. About 900, according to Chilean photographer Kena Lorenzini, whose blog http://lorenzinilorenzinikena.blogspot.co.uk/2012/06/homenaje-al-dictador-chileno-augusto.html contains her photos of incidents at the screening. Number of people protesting: “hundreds,” according to the New York Times http://www.nytimes.com/2012/06/11/world/americas/chileans-protest-pro-pinochet-film-screening.html, the Associated Press and other news sources. Number of police at the scene: “more than 500 police in full riot gear,” according to Agence France Press http://www.google.com/hostednews/afp/article/ALeqM5i_0_Nd6Yt5zFxytmOtE_60xRhMow?docId=CNG.ced5e98af01ff3b72bfea903de6874f4.31. Number of injuries: 22, mostly police, according to Chilean authorities. They include a member of Britain’s House of Lords, the rightwing French presidential candidate Marine LePen and from the United States, Miami-Dade County mayor Carlos Gimenez, Miami mayor Tomas Regalado, Senator Marco Rubio, Congressman Mario Diaz Balart, Florida state senate president Anitere Flores and Yasser Torres, president of the Juventud Anticastrista. This Sunday Santiago’s Teatro Caupolicán is scheduled to screen an admiring documentary about General Augusto Pinochet and organizers expect at least 5,000 to attend—not counting what will surely be a much greater turnout of protesters. The most expensive seats, priced at 15,000 pesos, or about $30, have already been sold out but there are still tickets available for 4,000 to 10,000 pesos. Families of the Pinochet regime’s victims and at least two dozen center-left members of the Chilean Congress have petitioned President Sebastián Piñera to stop the film screening, but a government spokesman said this would be a violation of freedom of speech. The director of the Americas department of Human Rights Watch (http://www.hrw.org/) Jose Miguel Vivanco told Radio Cooperativa http://www.cooperativa.cl/hrw-y-homenaje-a-pinochet-lamentablemente-tienen-el-derecho-de-hacerlo/prontus_nots/2012-06-05/185250.html that he concurred. “That a part of the public wants to express its support for a dictator who led a brutal, violent dictatorship for 17 years in Chile that is responsible for massive, grave human rights violations never seen before in the history of Chile, unfortunately have the right to do so,” he said.